Wire cages all share the same structure principles – wire sides supported by a plastic bottom tray base. The advantages of wire cages are varied. Hamsters enjoy climbing the wire, which will give you plenty of viewing pleasure – however, smaller hamster breeds could get stuck or even escape. Hamster teeth nibbling on the wire might be too noisy for you – considering they’re nocturnal creatures – and there’s a possible risk of teeth damage. Wire cages can encourage messiness, with bedding dispersed through the wire sides, so extra cleaning might be needed. Multiple level cages will provide space for your hamster. A good option if you’re short on space at home. Split level living – wire tops for space and deep bottoms for burrowing/nesting without the mess. For visibility, opt for transparent bottom tray bases. 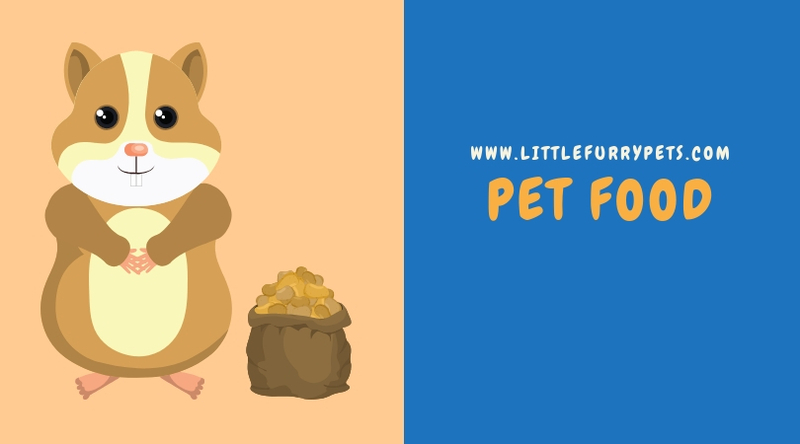 They are often purchased as aquariums and can be very effective as hamster enclosures – pretty much escape-proof, spacious for plenty of nesting materials, and easy to keep clean. Being glass, they’re heavy enclosures so if you order online, factor in shipping costs. Hamster activity won’t keep you awake at night if they’re in one of these, plus on a purely aesthetic level, these cages look stylish. Being fairly large, consider what space you have to accommodate one in your home – go for a minimum size of around 10-20 gallons, while they can go up to 80+ gallons. If space is a premium but you like the idea of a hamster tank, try a wire tank topper on a 10-20 gallon enclosure to give your hamster lots of room. Look stylish and are mainly escape proof. Far lighter than glass, they look similar and these cage types come in many weirdly wonderful colors – good for a children’s pet hamster. Available in varying degrees of design innovation, they are easy to maintain – although, if there are lots of different levels and activity areas, all of the components will need regular cleaning. You can get really imaginative by adding lots of activity options such as ramps and tunnels, plus there’s scope for stacked levels. A real positive about these cages is their visible entertainment value, which is good for bonding with your hamster. Good if home space is limited. Brightly colored and quirky – ideal for a child’s pet. If using several add-ons, be prepared for lots of cleaning. When choosing a hamster cage, think about what will best suit your particular hamster. Obviously, these enchanting little critters come in varying sizes – a factor in their popularity – so cages should be as secure as possible. Here are a few examples, based on size and breed. Being small, they can move very quickly and are bundles of energy. You don’t want your dwarf hamster getting stuck in tubes or tunnels, as well as escaping. Although small, dwarf hamsters vary in temperament – for example, Campbell’s Russians can be nervy so they need plenty of hiding places. On the other hand, dwarf winter whites are friendly little busybodies so set up a petting area for interaction. 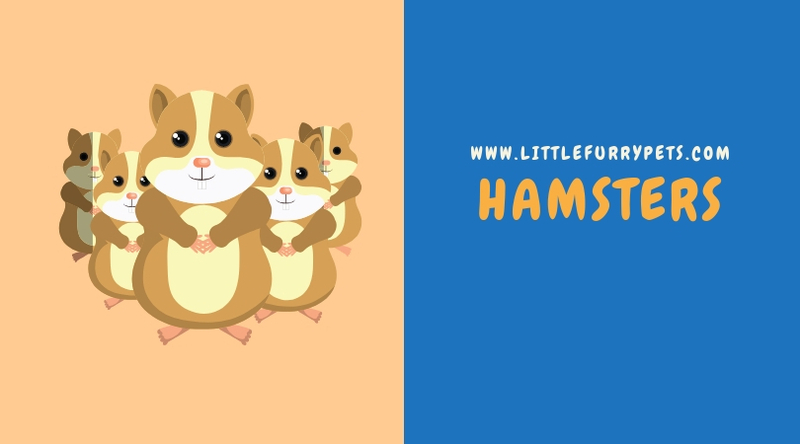 Chinese hamsters can be nippy if bored, and aren’t keen on being handled – glass tanks are a good choice for them, with space for toys and burrowing. In general, for most dwarf hamsters opt for solid-sided cages to prevent escape, with lots of visible activity areas for observation without stress. Tiny and super quick, they’re adorable bundles of energy who need lots of mental and physical exercise. Go for cages with solid sides to keep them safe, and provide tubes, tunnels, and wheels to keep them fit and well. Plastic/glass enclosures are fine, where you can opt for multiple levels, toppers, and add-ons to give your robo a stimulating environment. Otherwise known as teddy bear hamsters, their relatively larger size is suited to most cages, including wire. They need lots of space, so a glass tank of 40+ gallons is good, as is a large plastic cage. Plastic is particularly good if you’re short on space, but both options facilitate multiple levels. 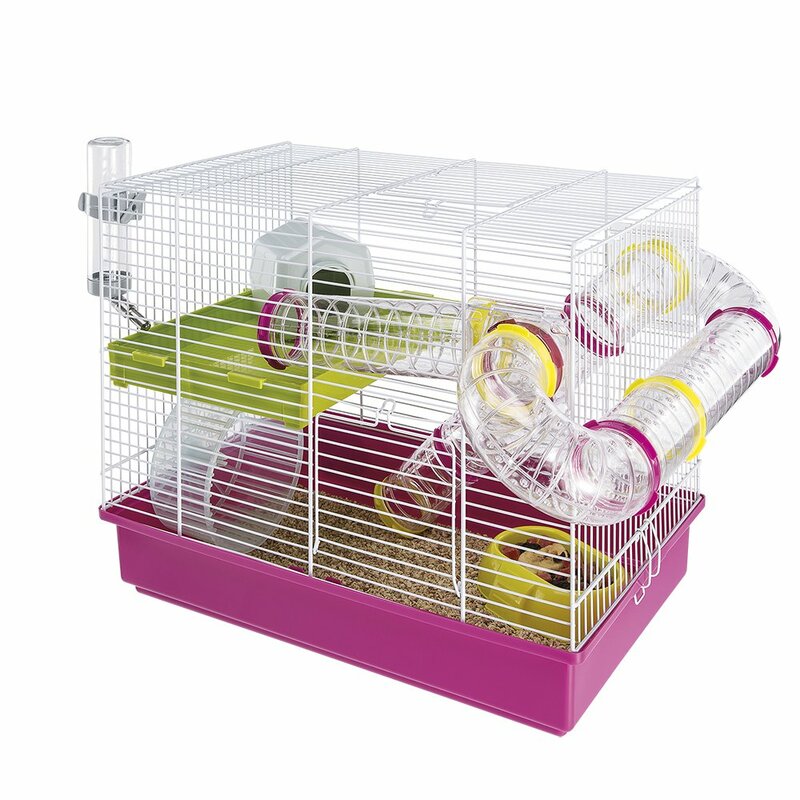 The ideal is a spacious cage which has a large bottom tray, with lots of room for wheels, tunnels and other fun toys. However, Syrian hamsters are known to gnaw on connector tubes so you’ll need to monitor this to prevent escapology antics. There isn’t a broad consensus among hamster enthusiasts but that’s not surprising. What are the best hamster cages depends on several factors. 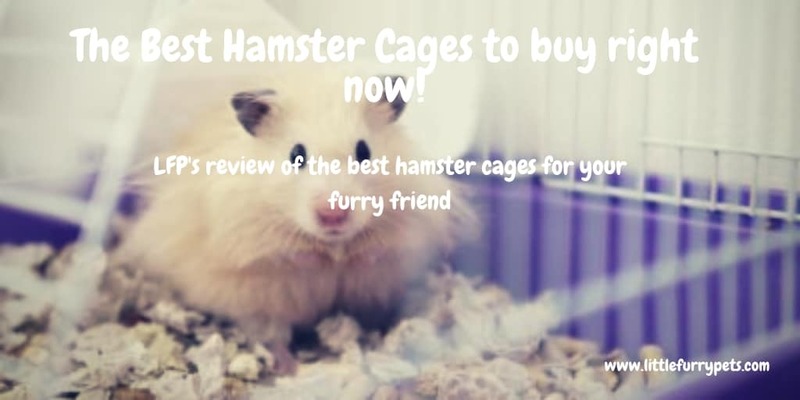 These include home space and hamster breed, as well as how much time and effort you want to put into cage maintenance. 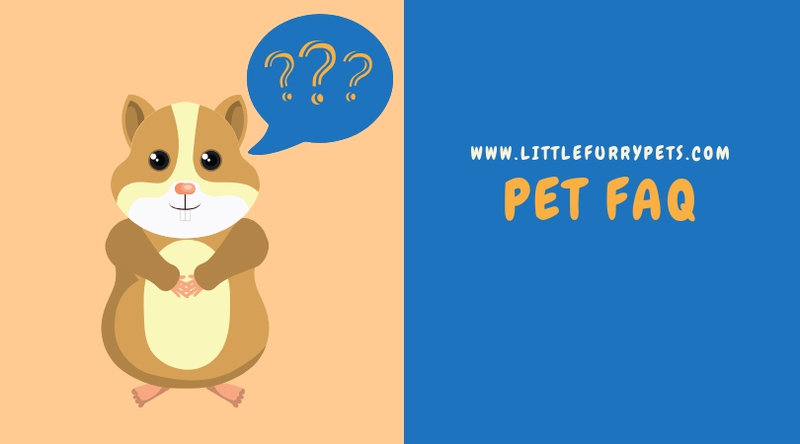 Do your research on the specific needs of your hamster – its size, temperament and exercise levels – and you won’t go far wrong. 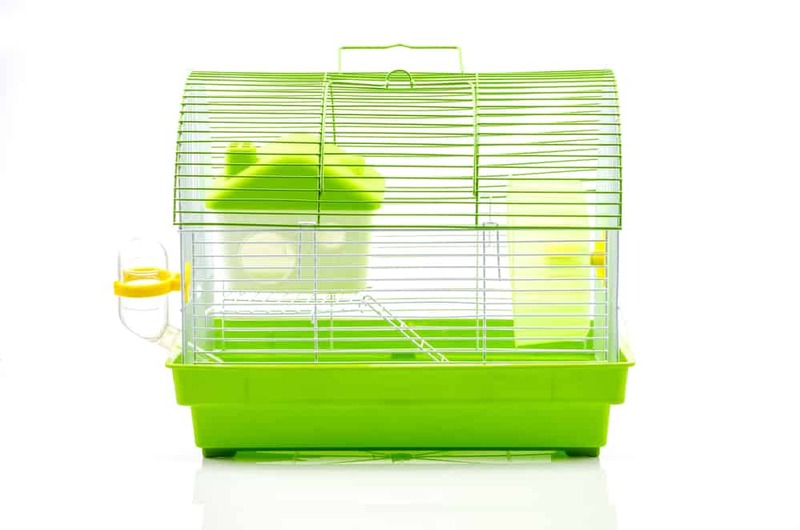 Making the right choice from the start will give your hamster the perfect home to settle into. The Savic Hamster Heaven metro hamster cage does exactly what it says on the box! The large bottom tray footprint is ideal for larger hamsters who require more floor space for exercise as opposed to verticle climbing space. The huge list of add-ons and accessories provide hours of entertainment for your hamster (and you!) and save any additional purchases. Included in the box are tunnels, platforms, slides, 2 houses to give your critter a choice of bedding, exercise wheel, toilet, food bowls and drinking bottle. The bottom tray base of the hamster cage is very sturdy and provides enough depth to fill up with a substrate to allow for burrowing and tunneling. The wire cage is strong and secure and fits in the bottom tray perfectly. All of which gives you peace of mind safe in the knowledge that any escape attempts will be met with a strong and secure obstacle! All of the accessories are designed with the larger hamster in mind. Which is great if you are keeping Syrian hamsters. Smaller hamsters may find themselves challenged by some of the climbing accessories such as the stairs. But overall we wouldn’t see this as a downside. 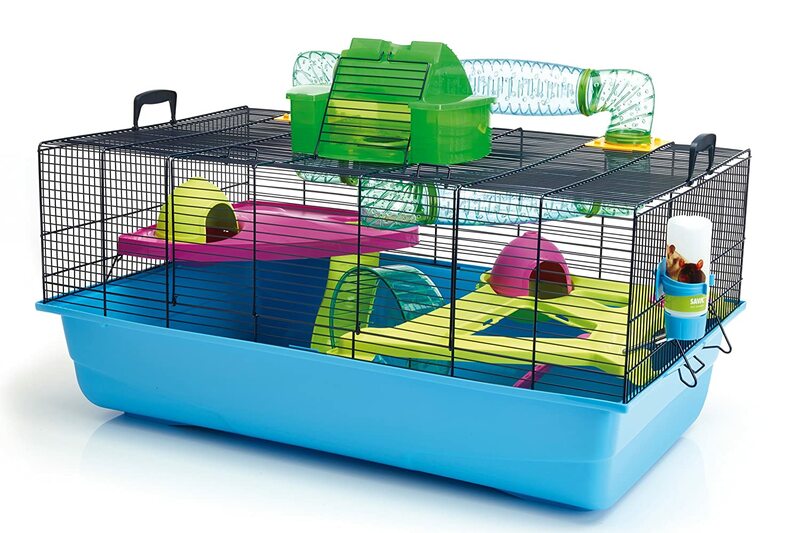 The accessories provided make the hamster cage hugely configurable, which we think is a great way of keeping things interesting for your furry friend! On the downside, the Savic hamster heaven metro cage is relatively expensive. But this we feel is justified by the size of the cage, excellent build quality and an impressive list of accessories. 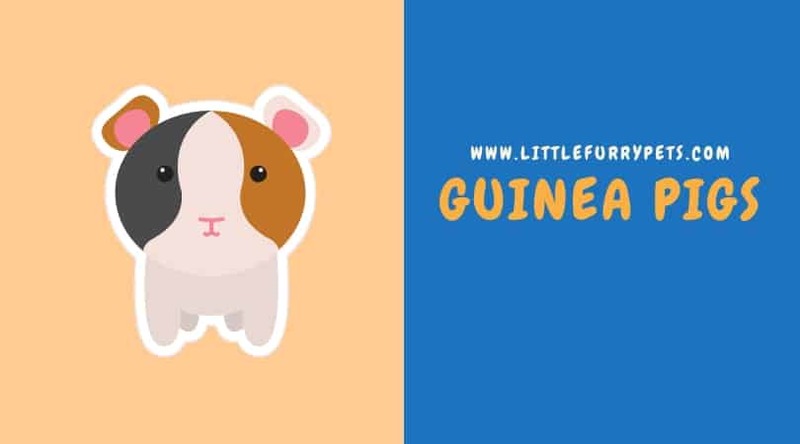 Great fun for you and your hamster! The top crawl tube is reportedly weak so it important to monitor for gnaw marks and potential escape attempts! The Ferplast Favola Hamster cage is a well built, solid no fuss kinda cage. The split level arrangement provides a good footprint on the lower deck for exercise and burrowing, with the upper level reserved for relaxing, eating and drinking. A cool feature of this cage is the transparent base, which allows you to take a peek into what your little furry friend is up to when burrowing into the substrate (of which the base provides ample depth for). The modular connection system on the Ferplast Favola hamster cage is also a great feature. This allows you to expand your hamster’s habitat with a wide selection of add-ons and accessories. creating new and fun routes and hideouts whenever you feel like it! 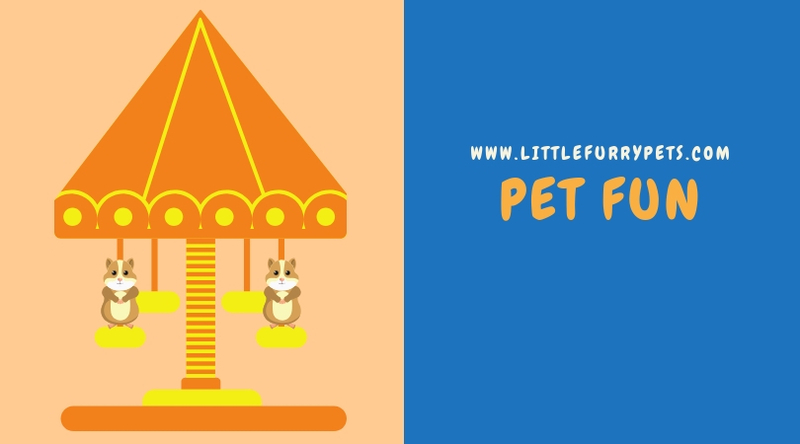 The Furplast Favola Hamster cage is complete with accessories such as a nest for your buddies bedding, bowl for food, drinking bottle with a special steel nozzle and a wheel for your hamsters favorite past-time. A useful door in the top of the cage allows for quick everyday maintenance. For a full clean, then the cage is detachable from the bottom tray using a series of clips. Although the Furplast Favola Hamster cage is fairly large and would meet the recommended minimum standards for a larger Syrian hamster, we have found that the wheel and add-ons are more suited to a smaller hamster. The wheel is somewhat on the small side. A colorful and happy habitat for your lively hamsters! 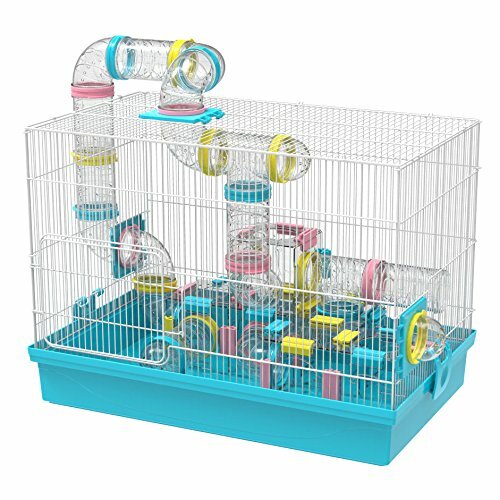 The Ferplast Laura hamster cage has been designed to be attached to other hamster habitats thanks to the special connection caps. 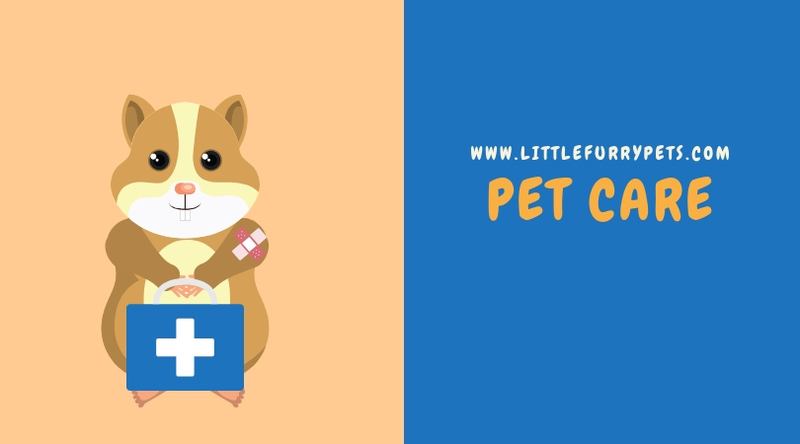 The Ferplast Laura hamster cage is complete with accessories making it very comfortable: a plastic bowl for food, a drinking bottle for water, a nest for pets relaxation, as well as tubes and wheel for playing. 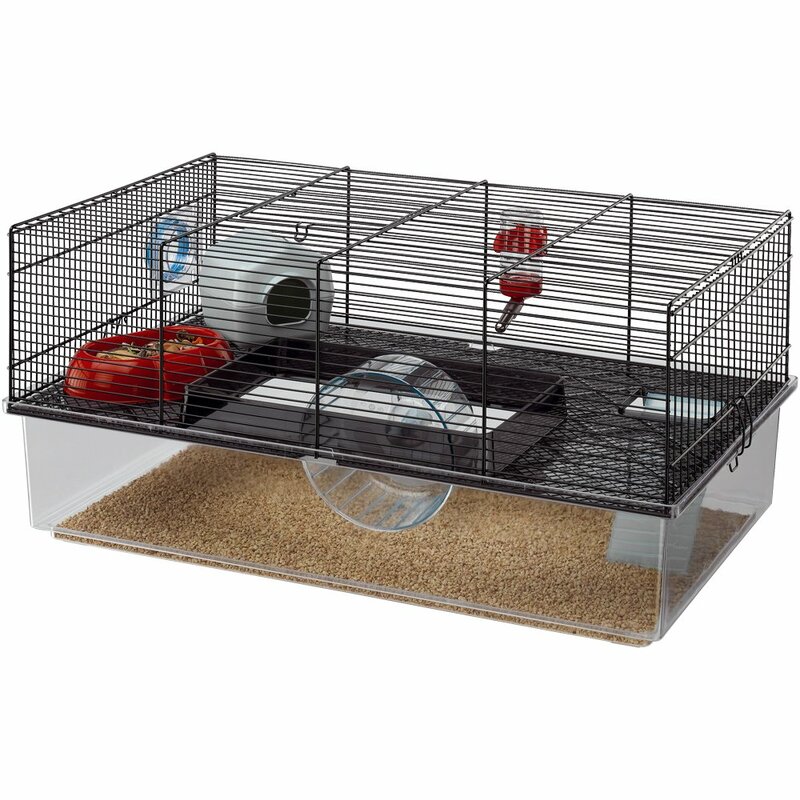 Besides, a plastic shelf fixed to the cage creates a practical floor where your small pet can rest. The Ferplast Laura Hamster Cage is easy to keep always tidy and has access doors on the front and top of the wire mesh, which makes it very handy for everyday maintenance. full cleans can be done by removing the plastic bottom tray, and by lifting out the bedding from the included hamster house. Again this model is aimed at a smaller critter due to the diameter of the wheel and tunnels. Wheel diameter is quite small for a larger hamster. The GNB Super Large Hamster cage is a great cage for those who like a certain amount of DIY activity! It comes with quite a few parts, and from what we found without instructions! but this shouldn’t put you off if you enjoy a challenge. The Cage is really big. Really really big. The tubes are adequately sized for a large critter, and there is plenty of floor space in the bottom tray for scurrying around and exploring. There isn’t any house or hideaway for your furry little critter’s bedding, but plenty of room on the base for an additional structure. The sheer number of parts allows you to be very creative with your designs, and if that isn’t enough you can purchase an expansion pack to add even more tunneling fun! The GNB Super Large Hamster cage great value, too. You will probably want to add your own wheel, but there’s plenty of space for that. Made from Wood coming only from sustainably managed forests, The Ferplast Hamsterville wooden cage is a robust eco-friendly product entirely designed for your pet’s comfort. Thanks to its Original structure with many levels, your furry friend will have space to exercise and play freely. Inside the habitat, special levels with ladders connect the different floors. The shelves have a special liquid-resistant coating making them very practical and easy to maintain. 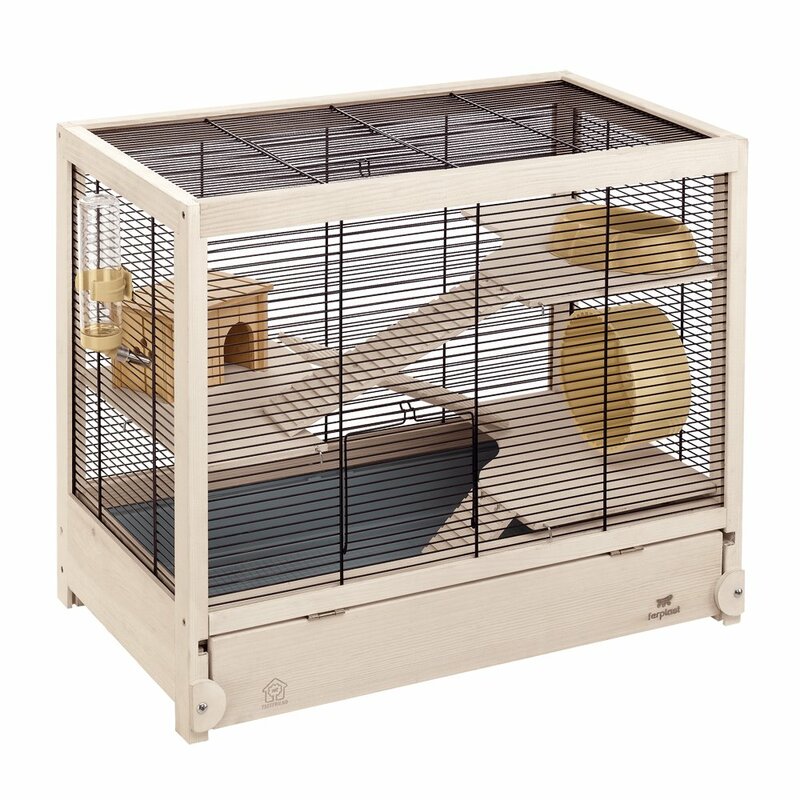 On the bottom level, the Ferplast Hamsterville hamster wooden cage has a pull-out bottom tray for easy cleaning. the bottom tray is nice a deep and makes it very practical and tidy when cleaning out your pet. 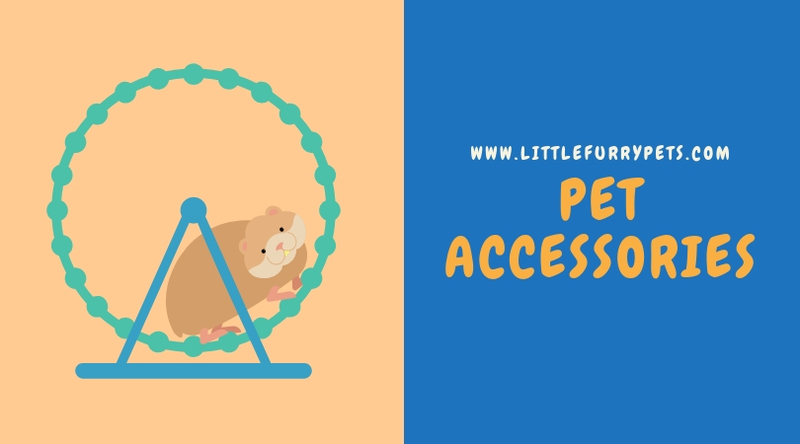 there’s a decent set of accessories included as well, including a hamster house, a wheel for exercise, drinking bottle and Feeding bowl. The wheel is OK, not great. Small doors make it a bit tricky for everyday maintenance and cleaning.